Have you ever seen Straw Dogs? Sam Peckinpah's banned 1971 film set in Cornwall in which, typically for much of Peckinpah's output, several very good character actors produce fine performances but gradually find themselves, the film and its reputation all overwhelmed by the sheer quantity of violence. I watched it - as well I could - on video some time last year or the year before. I hadn't realised, beforehand, that it contains a couple of scenes set around Susan George, at home, with a chess set. This is, paradoxically, a situation in which the chessplayer is at a disadvantage. When you're a chessplayer, and you watch a film, or read a book, which contains reference to chess, it is always a different experience to that undergone by the non-chessplayer: we are always looking at the chess. It is at the centre of the scene whether it is supposed to be, or not. What it means, what the presence of chess in the scene is supposed to convey, which is the most important thing, will seem less important to us than what it is. We see the small thing, not the large one. 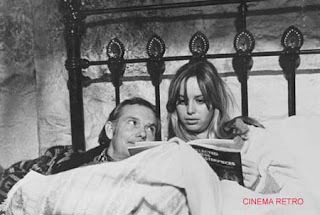 So, watching Straw Dogs, my concentration was on the chess set, and on the book that George had with her: and this, as mentioned in Monday's posting and as partially shown in the photos below (one from the film, the other taken on set with Peckinpah talking to George) was Svetozar Gligoric's Selected Chess Masterpieces. It's not a book I'd ever heard of - and perhaps that reaction helps to illustrate the problem, because of course most viewers would not have heard of it. Nor be expected to have done so. 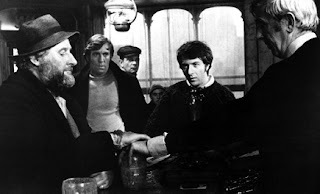 Nor is it likely that Straw Dogs works like a great painting, in which there are symbols present whose identities and meanings need to be uncovered, and where specific knowledge and understanding of those symbols is often of use to the viewer. It's most unlikely that it matters whether George reads Selected Chess Masterpieces or My Sixty Memorable Games: it's just important that it's a chess book. As a symbol it is a blunt instrument, but the chessplaying viewer wastes their time trying to locate the point. So why is George reading Gligoric, and why does she take her chess set to bed? Possibly because she is bored, because her new husband spends so much of his time immersed in his mathematical work. Possibly the message (Peckinpah being Peckinpah) is no more subtle than this: Hoffman is such a weed that she might as well take a chess set to bed. Possibly George is trying to impress her husband, to exhibit interest in the most intellectual of games in order to try and show him that she, too, is worthy of his attention. Possibly she is a genuine chessplayer herself, and the idea is to show that she has a brain as good as Hoffman's even though he does not appreciate it. I don't know. I wasn't thinking about it: I was distracted. I am a chessplayer. I was distracted by the chess. I'd have to watch it again. Perhaps I will. But, as I said, it's a difficult film to watch.